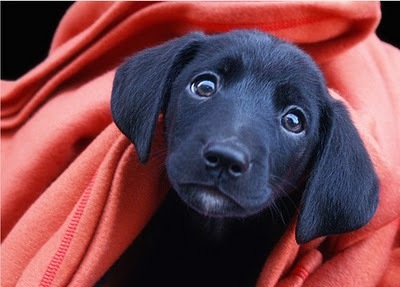 I have been asked many times what is the best food for a black lab puppy. Being the owner of a very healthy 5 year old black lab, I feel as though I am somewhat of an expert. At least I have the experience to able to share pertinent and accurate advice to those who ask this question. There is a myriad of dog food out there that are available for your puppy. It is very important that you spend the money that the good quality premium dog food offers. 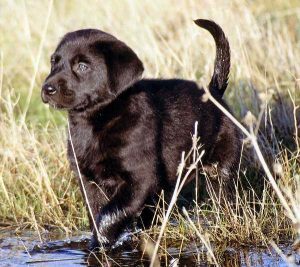 If you are investing time and money into a black lab puppy, it will be well worth your money to invest and get the food that he or she needs. Please, please, please.. in my humble opinion stay away from “popular” or “main-stream” brands. The lower price tag only reflects the lower quality , less nutritional food that these “well known” brands offer. Don’t go to Walmart or the Grocery Store to buy your dog food! Not only do premium foods provide a for nutritious healthy benefit, but they also produce less waste. You will not have to feed your growing puppy as often or as much. They will be stronger with better muscle mass and less fat. They will have more energy, be more productive and growth will be optimal. 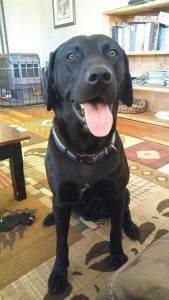 I am not a paid representative, nor do I receive any benefit from telling you this but I use Victor brand dog food for our dog Guinness. We have feed him Victor since he was born. 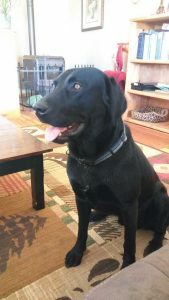 He is now 5 years old and a 100 pound healthy, sleek, energized black lab. When Guinness was a puppy, he was fed Victor Active Dog & Puppy Formula. The kibbles were smaller than adult dog food making it easier for puppies to chew, swallow and digest. It is also grain free and gets it proteins from different sources. Beef, Chicken Pork and Fish to be exact. It is also beef, chicken and pork grown in the USA! It is a specific meal rendered from a specific fish. It is traceable, not just some rendered fish from somewhere that contains something.. It is high in Omega 3 and 6 Fatty acids. Menhaden fish meal also contains DHA and that is important to a puppies growth and development. Here is an article about Menhaden fish meal on Pet Food Reviewer if you wish to learn more. The other main ingredients of this puppy food are peas and sweet potatoes. I can’t really talk about the peas.. but I know our Guinness LOVES sweet potatoes. To this day, my wife cuts up sweet potatoes (my wife make the best sweet potato fries!) and adds them to Guinness food. He loves them! So I like to think that the flavor he loves so much comes from the food he ate as a puppy. Guinness, as an adult, has always been fed twice a day. Once the morning, and once in the evening. before bed. We used the weight guide on the back of the bag to determine the amount. Amazon sells a small 5# bag, here is the link if you want to try it out with your puppy. We were really happy we did. Now at the ripe old age of 5 he gets 2 cups in the morning and in the evening the same amount, 2 cups. So in total of 4 cups a day. We never forget to feed him because he has a stainless steel 2 cup bowl and if we are late he picks up that bowl and tosses across the hardwood floor. Use your imagination.. The food he gets in the morning, he munches on throughout the day. I think he is a bit of a lazy eater sometimes… until he gets that night time helping and he wolfs that down like he is starving. I like this food for him because it is high in protein, 80% coming from meats, and has NO FILLERS like corn, gluten, soy or wheat. These fillers make dogs fat, produce a ton of waste (poop) and really serve very little to no nutritional value. The High Energy Formula also contains Omega 3 & 6 fatty acids along with Vitamin E to give Guinness that shiny sleek black coat that all the girls notice. As far as drinks go, the only thing we have ever given any of our dogs is water, and as much as they want to drink. Here is a link to this food in Amazon. I know they sell different sizes. The price also fluctuates a bit as well. Another small thing I’m going to suggest. Get yourself a Dog Food bin. I am going to suggest you get one big enough to hold one big bag of food, plus a little extra so that when you get food, you won’t be out (most of the time) and will be able to add a full bag to what is left in the bin. ALSO, get one with wheels. We have ours in the pantry and it is wheeled out of the way when we are not getting food. 30 plus pounds of dog food rolls way easier than it lifts or slides. The IRIS that we use holds 55 lbs and it airtight. It also has wheels. Here is a link to one on Amazon if you want to take a look. You will not regret getting one of these. It also keeps the annoying cats from tipping over the bag! Victor has 8 or 9 different varieties of dog food. My son had a BIG Chocolate lab (Koda) and he fed him a Victor Ultra Pro. Its a little more pricey, but worth it considering that it is for really active sporting dogs and that is what Koda was. Guinness is more of an active pet so that is why we choose the food that we did. There are other premium dog foods that are probably similar to Victor in nutrition and cost. Taste of the Wild, Science Diet, IAMs, Eukanuba and Blue Buffalo to name a few. I have never feed my black lab anything but Victor and I don’t regret the choice at all. I would guess that these other brands offer something comparable..
but the take-away from all this is: DONT BUY CHEAP DOG FOOD. Your puppy deserves the best food it can get that is readily available. They will live longer, be healthier and provide a better companion experience for you and for your dog.